This week I will be featured on Karen Doctor’s blog and decided it would be fun to do a giveaway for DEMON RISING. All you have to do is sign up for my newsletter, that will keep you up to date on new releases from the world of DeAnna Browne, and I’ll pick a lucky winner at random for a free e-book. It’s easy. Click the link below to sign up, and I’ll announce the winner on Saturday, January 20th. On the hunt for her missing sister, she must rely on Darion, a treacherous ex-boyfriend with ties to the local coven for back-up. Problem is he’s a pyromancer that can’t be trusted, especially with her heart. 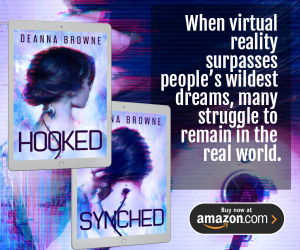 Becca’s forced to navigate a dangerous web of deceit and must decide what’s she’s willing to sacrifice to save her sister. I have the first page below for those that want a sneak peak. Also remember if you sign up for my newsletter (click here to sign up), I have a free short story based on one of the characters from Demon Rising, Nevada. He’s one of my favorites. Hope you enjoy. The tattoo on Becca’s neck prickled as she walked the crowded path to work. Searching for the possible source of magic, she continued forward, with coffee in one hand and the other resting by the knife at her waist. She moved amid a throng of people, shuffling along the worn walkways. Heavy clouds were scattered across the sky, while dilapidated buildings surrounded them, a haunting reminder of what once was. A young man pushed past Becca, dressed in blue coveralls. He must be heading to the line. The tattoo on Becca’s neck prickled as she walked the crowded path to work. Searching for the possible source of magic, she continued forward, with coffee in one hand and the other resting by the knife at her waist. The warehouse traveled up twenty stories high, the tallest building in town with a large fountain in front. It must have once been a beauty. Now the fountain, covered in graffiti, ran dry and the boarded up windows could barely keep the wind out. A familiar, lanky guard stood watch on the side of the road. Could he have been the source of the magic warming her tattoo? He scanned the crowd with a demon dog at his side, a German shepherd with unnaturally large black eyes. Turning forward, she let her dark hair fall into her face, not wanting to draw his attention. She stepped past the guard undisturbed. She could handle herself with the guards, but her boss, Nikko, constantly nagged her about keeping a low profile. The crowds pressed together, and a large man knocked into Becca’s side, tripping her. She stumbled, spilling the remains of her coffee all over her black jeans. Someone swore as the crowd surged forward, and she stepped to the side. At five-foot-five, she was on the small side, but strong enough to cause pain and scrappy enough to avoid it when she could. The crowds weren’t her problem, though. That would be the presence behind her, causing her tattoo to burn. I’m excited to announced my debut novel, Demon Rising, will be released with Black Opal Books mid-August 2017. As this is my first book baby, I’m a ball of nerves. But I’m already done with book two and it’s under contract. So ready or not, here we come.